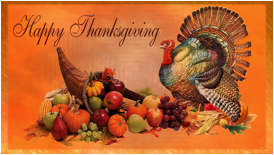 by Seton Motley, Contributing Author: Turkey: Thursday is, of course, Thanksgiving. A holiday which celebrates our inconceivable good fortune and tremendous bounty. Most of us celebrate our good fortune – by joining with family and friends to consume massive amounts of bounty. We (should) do so in large part in remembrance of how hard it was for the Pilgrims to scrape together enough food on any day – let alone the fourth Thursday of November. And to commemorate their perseverance – they eventually began to make it work. Leading to now, when we whenever we wish merely head to any abundance-laden grocery store. Turkey: Monday night-Tuesday morning, the nation of Turkey shot down a Russian jet. The latest globally destabilizing incident in a giant heap of them. Our State Department early Tuesday morning issued a worldwide travel alert.Current information suggests that ISIL (aka Da’esh), al-Qa’ida, Boko Haram, and other terrorist groups continue to plan terrorist attacks in multiple regions. These attacks may employ a wide variety of tactics, using conventional and non-conventional weapons and targeting both official and private interests. This Travel Alert expires on February 24, 2016.Meaning the entire planet is for Americans basically off-limits – for (at least) the next three months. The world is always a dangerous place. When the United States President unilaterally withdraws from any role in making it less so – while making ridiculous assertions like “No challenge poses a greater threat to future generations than climate change” – things get demonstrably worse. This heightened danger makes all things global much more difficult. Including trade – which is less free and more expensive in times like these. Whenever it is possible, we trade very freely – but we must be smart when choosing which products we should outsource. Turkey: I’m about as big a free trader as anyone on the now increasingly dangerous planet. I love as many countries as possible freely trading goods and services in as many directions as possible. But there are trade goods – and then there are life vitals. Outsourcing iPhone and television production is absolutely fine. Letting other nations nigh-exclusively produce our food – can be highly dicey. Especially so when the global security situation – looks like this global security situation. So to say that continued domestic food production is a national security imperative isn’t silly – it’s serious business. At which the House of Representatives recently began looking. (T)he House Agriculture Committee held its first in a new series of hearings to examine the relationship between agriculture and national security. In the opening hearing, members and witnesses examined the threats and vulnerabilities to agricultural security as well as the economic significance associated with such threats…. “The bottom line is that a nation that can feed and provide for itself is inherently safer than a nation that cannot….” said Agriculture Committee Chairman K. Michael Conaway.All things are not self-evident. This is. Global free trade is, of course, not a two-way street – it’s a superhighway cloverleaf. If one or more participants insist on tariffing, regulating and subsidizing – it’s much-less-freer-trade. So when people like us say unilaterally disarming our admittedly-very-dumb government food programs is a really bad idea, it’s not because we aren’t free traders – it’s because we are. And because we realize that food ain’t phones. We can get by without the latest Samsung Galaxy – but we can’t get too far if our tables start emptying. So we must unravel our very-dumb-food-programs – by getting other nations to unravel theirs. That way their government-assisted food imports don’t wipe out our domestic production – and leave us with the very real potential to go hungry when things globally go bad. Times like – right now. So let us revel in our Thanksgiving. Knowing we have so much for which to be thankful – and to consume – in large part because we continue to produce so much domestic bounty. And let us remember that it is a big, bad world out there – and that leaving our food production nigh-exclusively to it would be a recipe for perpetual Pilgrim-esque shortages. Tags: Seton Motley, Less Government, Talking Turkey, National Security, Growing our own food, food To share or post to your site, click on "Post Link". Please mention / link to the ARRA News Service. and "Like" Facebook Page - Thanks!